The Aggie Ring is the most visible symbol of the worldwide Aggie Network and one of the oldest and most revered traditions of Texas A&M. 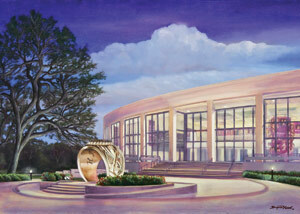 The Association of Former Students' Board of Directors established the Aggie Ring Scholarship Program in 2009. In 2018, 230 students were impacted through 119 endowed Aggie Ring Scholarships and a general scholarship fund for Aggie Rings. We invite you to support Aggie Ring Scholarships and help ensure that the Aggie Ring is available to every Aggie who has earned the right to wear one. Learn how to apply for an Aggie Ring Scholarship (current students). Upon receipt of the initial gift, the donor will be recognized with a beautiful Benjamin Knox print of the Clayton W. Williams, Jr. Alumni Center and the Haynes Ring Plaza. The donor will also have the opportunity to be involved in the scholarship recipient’s Aggie Ring Day and will be invited to the annual scholarship brunch hosted each spring by The Association of Former Students. If you would like further information about establishing an endowed Aggie Ring Scholarship, please email Sheila Nelson '92 at SNelson92@AggieNetwork.com or call her at (979) 845-7514. Gifts of any amount under $25,000 may be made to the general fund for Aggie Ring Scholarships using the online giving form. Gifts to the general Aggie Ring Scholarship fund are pooled, and the income is used to provide scholarships.